We are leading distributor of polycab submersible winding wire use for pump cable. This Polycab Flexible Cables are suitable for applications that require constantly flexibility. Bundled flexible cables makes it durable. Polycab house wires carry a guarantee that far exceeds the ISI Certification they possess. Tested at every stage and supervised by experienced engineers, Polycab house wire are making a name for themselves in both Indian and world markets. 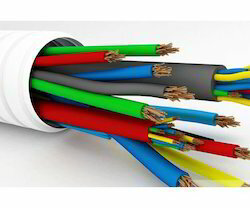 We are one of the leading Supplier of wide range of Polycab Wires & Cables which are designed to service the Residential, Commercial & Industrial application. We are offering wide range of HT & LT cables. Being a noteworthy business enterprise, we are readily indulged in presenting to our customers Electrical Polycab Wires.